Student loan repayments are often collected through payroll. A deduction is made from the employee’s pay and paid to HMRC as part of the employer’s PAYE payments. The amount of the deduction is determined by the employee’s level of earnings and the ‘Plan Type’ of the student loan in place. Payroll Manager is able to make the necessary calculations and deductions automatically. Student Loan Plan 1 (SLP1) : Applies to all students that lived in Scotland or Northern Ireland when they started their course, and also to those that lived in England or Wales and started their course before September 2012. The annual threshold for Plan 1 loans is £18,330 from 6 April 2018. (The threshold for 2018-19 will be £18,935). Postgraduate Loan (PGL): A new type of loan, introduced in April 2019. The annual threshold for Postgraduate loans is £21,000 from April 2019. When taking on a new employee you should ask them to complete a new employee form on which they can declare which plan type student loan they have (if any). This form can be produced by clicking ‘Forms‘ from the main menu in Payroll Manager and then ‘Blank New Employee Form‘. (If the employee provides a P45 on joining then this will also confirm that they were making Student Loan Repayments via their previous employer, but does not tell you which plan type to use). 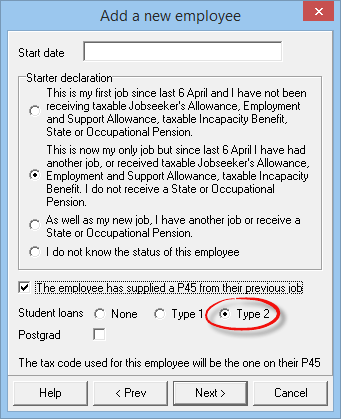 – When adding a new employee to the payroll (after clicking ‘Employees’ then ‘Add New Employee’ in Payroll Manager) you are taken through a number of input screens, one of which contains the ‘Starter Declaration’ where you can record the ‘Start Date’ and ‘Student Loan Plan Type’. 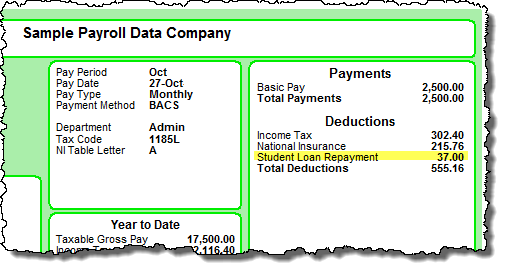 – After entering these details (providing that you already have pay entered for this employee), Payroll Manager will calculate the relevant student loan deduction amounts automatically, and display them in the ‘Deductions’ section of the ‘Pay Details’ screen. Note: If you forgot to add details of the student loan plan type when first adding the employee to the payroll or have made a mistake when doing so then please follow the instructions below. You may receive instructions from HMRC to start making student loan deductions from an existing employee either via form SL1 ‘Start Notice’ (which will tell you which plan type is applicable) or via a ‘Generic Notification Service student loan reminder’ message (in which case you should ask the employee which plan type you should use). 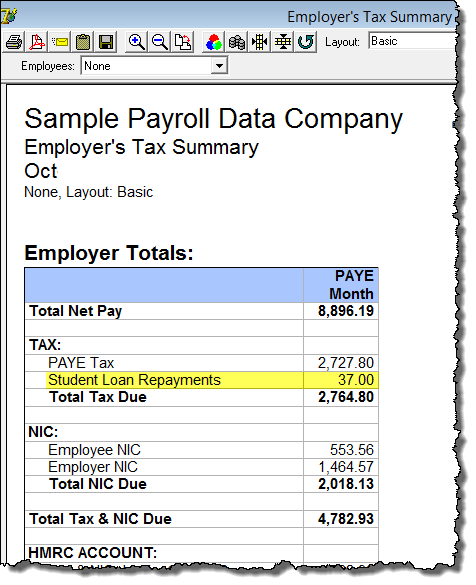 – Go to the ‘Pay Details‘ screen in Payroll Manager, click on the ‘Deductions‘ tab and select the appropriate employee. 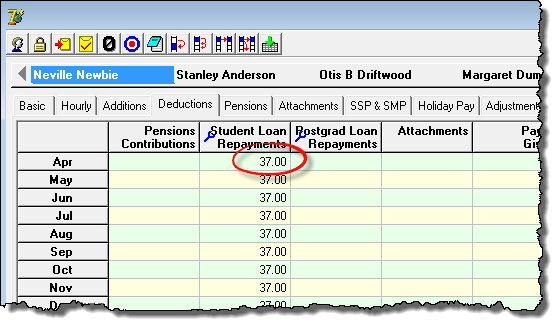 – Click on the ‘blue spanner‘ symbol at the top of the ‘Student Loan Repayments‘ column (or the ‘Postgrad Loan Repayments‘ column for postgraduate loans) and enter a ‘Start date‘ in the relevant box. HMRC ask that you ‘start making deductions from the next available pay day‘ so the date that you enter should be that employee’s next pay date. IMPORTANT: Do not enter a date earlier than this, even if the notice specifies an earlier date, as doing so may affect previous pay periods. Payroll Manager will calculate and display the relevant student loan deductions on the ‘Pay Details’ screen and on the employee’s payslip. 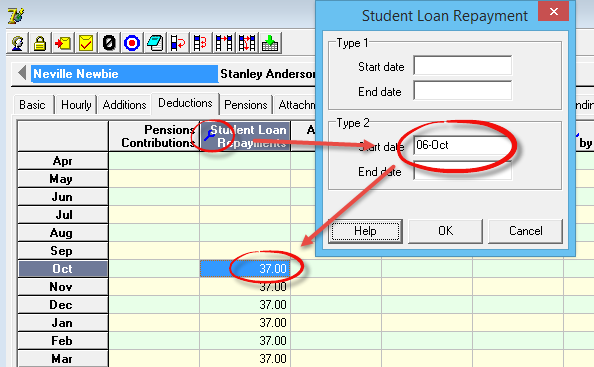 If you receive form SL2 ‘Stop Notice’ from HMRC then you should enter an ‘End Date’ into the Student Loan Repayment box in Payroll Manager (on the same screen as you entered the ‘Start Date’). Payroll Manager will stop calculating deductions from that point onwards. Student Loan Deductions are reported to HMRC via RTI FPS returns. The deducted amounts are then paid to HMRC together with the PAYE Tax due for that period. Student Loan Deduction amounts are summarised on the ‘Pay‘ – ‘Employers Summary for Tax Period‘ report. An employee has not yet earned above the annual threshold but the software is still calculating deductions – why? – The annual threshold is divided by the number of pay periods in a year in order to determine the monthly or weekly threshold. e.g. the annual threshold for plan type 2 loans from April 2018 onward is £25,000. The monthly threshold is 25,000/12 = £2083.33, and the weekly threshold is 25,000/52 = £480.77. If a monthly paid employee earns more than £2083.33 in any one month (or a weekly paid employee earns more than £480.77 in any one week), they will be liable for student loan deductions in that particular pay period, regardless of their pay in other periods. I can’t see anywhere where I can enter postgraduate loan details – why? – Postgraduate loan repayments are being introduced in April 2019 and so the relevant columns will only show in Payroll Manager files from April 2019 onward.